How to make pork chicharon. 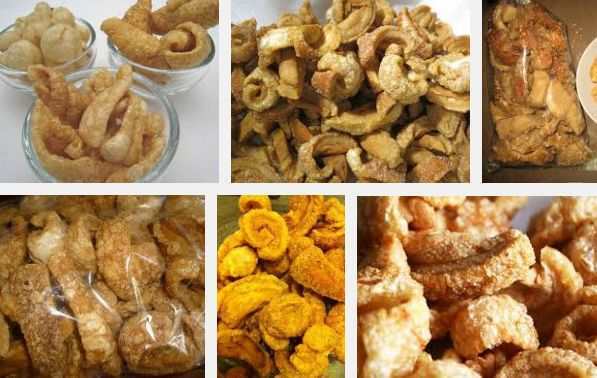 Chicharon also called pork cracklings are usually made with different cuts of pork, but sometimes made with ram meat. The pork rind type is the skin of the pork after it has been seasoned and deep fried. Chicharon is usually eaten with vinegar or with bagoong, lechon liver sauce, or pickled papaya called atchara. Other chicharon variants are chicken chicharon, beef chicharon and fish chicharon. 1. Boil cut pork rind in water and salt for 30 minutes. 2. On an oven pan, spread the cooked pork rind and bake at 300 F for 3 hours. 4. Deep fry rinds in a skillet in hot oil over high heat until they puff up. For pork chicharon dipping sauce: Combine all ingredients and mix well.